I wasn’t one of those guys that had a big issue with the plastic handles on the original Griptilian. I always thought they were light and durable. Maybe not the sexiest choice of materials, but certainly practical. But for many the plastic handles of the Griptilian were a source of contention at best. At worst they were a deal breaker. So for the longest time if you wanted a Griptilian with G-10 handle scales, you had to go to the after market. This market was pioneered by ex-pat Kevin Wilkins. His line of WilkinsGRIP aftermarket scales were the enthusiast’s best choice if you wanted a G10 Griptilian. Benchmade finally came around in late 2015 and released both the 551-1 Griptilian and 556-1 Mini Griptilian with G-10 handles. This is arguably the most exciting thing Benchmade has done since the 940-1 Osborne. This knife was provided to me free of charge by the fine folks over at KnifeArt. In no way has this impacted my impressions of the 551-1. I think the people over at KnifeArt are good guys, I think they run a quality website, and I appreciate their letting me check out this 551-1. Now on to the review. The 551-1 has an overall length of 8.07″, a 3.45″ blade, weighs 4.17 ounces and is made in the USA. The G10 version is almost an ounce heavier than the original Griptilian, but it does not feel heavy for it’s size, and seems significantly lighter than my WilkinsGRIP equipped BM 552 / Ritter Griptilian. The 551-1 has an identical drop point blade to the original Griptilian and is offered with your choice of thumb stud or thumb oval. I always preferred the look of the thumb stud version of the Griptilian, so that is what I got. When I compare this blade to my original Griptilian the only difference I can detect is that the blade has been given a bit of a stonewash. Of course, the 551-1 features a new blade steel, and I will talk about that below. But beyond that you have the same excellent blade shape of the original Griptilian, with a saber flat grind, and swedge. This classic drop point shape has served me well for many years now. Besides the switch to G-10 scales, the biggest news about the 551-1 is change to CPM-20CV blade steel. This is a steel that I was previously unfamiliar with. Manufactured by Crucible Industries, CPM-20CV is advertised as a steel with high corrosion resistance and wear resistance, and good toughness. Chemically it is similar to M390, which is an excellent steel. CPM-20CV has an extremely high chromium content, which results in its corrosion resistant qualities. From what I can gather, this appears to be a good choice for a folding knife. It may not have the toughness of a steel like 3V, but I think the extra corrosion resistance is a nice trade off here. My regular 154CM Griptilian has been through the ringer, and it occasionally shows small spots of rust if I forget to clean it. My 551-1 came razor sharp from the factory, and this 20CV seems to hold an edge well. So far I have used the knife to break down a few boxes, open mail, etc. I haven’t wailed on this knife like my original Griptilian and so far have only needed to gently strop the knife to maintain its edge. No corrosion or complaints thus far, but I am not 100% convinced that this steel is worth the price premium over regular 154CM to me. Still, it’s an interesting steel and I intend to keep this knife for long term testing and evaluation. I’ll update this review as I “gather more data points” and use the knife in the coming years. So far so good. Obviously the handle is the main event here for the 551-1, and is basically the entire point of this knife. I am pleased to say that this new G10 handle has been beautifully executed. It is fully 3-D machined, and features bright blue liners and anodized blue backspacers beneath gray overlays. I am not sure if the gray-blue combo would have been my first choice, but the blue certainly “pops” here and my handle has been flawlessly executed. I am hoping Benchmade will roll out some other color combos in the future. 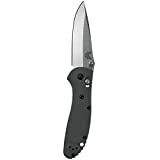 Like the original Griptilian the 551-1 features partial nested steel liners. That is about the only similarity with the handle construction of the original Griptilian. Even the hardware has been upgraded on the 551-1. This new handle is a totally different animal and it transforms the look and feel of the knife. My favorite aspect of the new handle is how they shaped it to match the contours of the original Griptilian. If you handle aftermarket scales for a Griptilian, they are usually very big and boxy. These aftermarket handles change the ergonomics substantially and add additional weight. That is not the case for the 551-1. Here you get a feel in hand that is very faithful to the original FRN Grip. Of course there is a little extra weight, and the G-10 does feel slightly different, but the overall profile and hand filling nature of the original model has not been lost in translation. Benchmade did away with some of the extra texturing on the handle, and the diamond pattern here isn’t quite as grippy as on the original knife, but there is plenty of grip here for me and I’d go so far as to say that this is an improvement over the original knife from an ergonomics perspective. Benchmade decided to include a deep carry pocket clip on the new 551-1 rather than their original spoon clip. I like this deep carry clip. It makes for a discrete knife that I have actually worn with slacks at work a few times now. This is a proven clip design. I think the 551-1 carries well for what it is. This is a larger knife, and it is heavier than it’s FRN predecessor, but this is still something that normal guys can carry and use and I think this is a viable EDC option (although admittedly the mini-551-1 is really all you will need for 99% of your EDC tasks). Benchmade has equipped the 551-1 with an impressively beefy set of phosphor bronze washers. Because you have an open back design, the washers are very prominent on this knife. The blade flicks open effortlessly. This is a satisfying knife to open and close. Whether you decide on the thumb stud version or the thumb hole version I don’t think you will have a problem accessing the blade. Of course for lock up you have an axis lock here. I have discussed the axis lock for years now. It remains one of my favorite locks as it is fully ambidextrous and allows you to easily open and close the knife with one hand. I find that the use of G10 handle scales adds a lot of structural rigidity to an axis lock knife and the 551-1 is no exception. It feels solid, and may inspire more confidence in the end user than FRN. Blade centering is perfect on my knife, as I would expect from a nearly $200 folder. I must admit I was somewhat skeptical about this knife given the enormous price premium over the regular FRN verion, but the 551-1 has been beautifully executed, and I can see where the extra money went. They didn’t just slap some G10 on this thing and call it a day – every single facet of the original Griptilian has been re-considered and in someway upgraded. It’s clear Benchmade spent a lot of time and effort to dial in the 551-1. Compared to its FRN predecessor, this new 551-1 is simply a superior tool. If the original FRN scales drove you up the wall, then the 551-1 cures that ill handily, and if you are a Griptilian fan I’d say this is basically a “must buy”. I was skeptical at first, especially given the price point, but the 551-1 has exceeded my expectations. I recommend buying the 551-1 at Amazon, or BladeHQ, KnifeArt.com. Please consider that buying anything through any of the links on this website helps support BladeReviews.com, and keeps the site going. As always, any and all support is greatly appreciated. Thank you very much. Would you say you prefer the 551-1 to your Wilkin’s Grips? I’m having a bit of a BM renaissance after picking up one of the KSF exlsusive M4/CF Stryker’s. The fit and finish is leagues better than I remember BM executing a couple years ago when I was into them. Now it has me looking for another BM with the same kind of solidity. I’m not sure if that’s due to the full steel liners on the Stryker though. So right now I’m looking at some sort of Wilkin’s Grips, or getting one of the H&K Axis lock knives and having the scales replaced. I have yet to see a direct comparison between the 551 and the Wilkins Grips though. Frankly I think the 551-1 blows the Wilkins Grip out of the water (no offense to Kevin Wilkins, who has done a great job with his scales considering he is just 1 guy in Germany). The scales on the 551-1 have been executed beautifully and it’s a much lighter and more refined knife. You can see in comparison how blocky the Wilkins Grips are – the end result is that these are 2 totally different knives. So yes, I prefer the 551-1. And I agree with you – while there have not been a ton of interesting new Benchmade models, they have upped their game from a manufacturing standpoint, and knives like the 940-1, the 551-1, etc, have raised the bar in a different way for the company. Great review, Dan. I actually just picked up a 555-1 yesterday. I’m absolutely loving it so far. Like you said, it feels like an overall upgrade of the standard Griptilian. My only complaint is that the action on the axis lock feels a bit gritty compared to my other mini Griptilian. I’ve read a few other reviews saying the same thing of -1’s and I was wondering if your example had a similar problem. Congrats on the new 555-1, and I am glad to hear you are enjoying yours. My knife is smooth as glass – no grit in the action at all. Maybe some compressed air and fresh lubricant will do the trick? Or I suppose you could take the knife down, but that would be a shame with a brand new knife. At any rate, I hope you continue to enjoy it. You should update your Griptilian vs. Paramilitary 2 review ? Do you still favor the PM2 over the Grip[551-1]? I will definitely update my Griptilian v. Para 2 article to include some more thoughts on the G-10 Grip in the not so distant future. Subjectively, I prefer the G-10 Grip over the Para 2. I think this is just a beautiful knife and I see it being worth the price premium over the Para 2. However, if you were to try and equalize the knives for price, and look at the knives on a more rigid/objective basis, I think it would still be close. Dollar for dollar, the Para 2 is very tough to beat. But if money is no object I like the 551-1 more and I personally think it is worth the premium in price. Thanks for checking out the review. These improvements are exciting. After picking up a Crooked River last month, it looks like I’ll be getting another new Benchmade — probably the sheepsfoot G-10 Mini Grip. Not usual for me to be picking up >$150 knives at that rate. Thanks for stopping by. I agree that these updates are exciting. I picked up the Crooked River as well – it’s a cool knife. I look forward to comparing notes on that one at some point. Great review as always. The 551-1 looks to be very similar to my REI special edition Griptilian aside from the steel and the pattern on the scales. The most interesting upgrade for me though is the pocket clip. Will that clip attach to the other Griptilians? It looks to be the same hole pattern on the scales as the others. If so, I think I will have to upgrade my pocket clip if possible. People really like the clip (and for good reason as it’s an awesome discrete clip – I like it too). It will attach to the other Griptilians. If you write Benchmade or send your knife in for service and ask them for a deep carry clip, my guess is that they will simply send you one. As I understand it they if you buy a Benchmade they’ll ship you some absurd number of free clips. I honestly think only KAI can really compete with Benchmade in the customer service and warranty department. That is consistent with my understanding as well. BM is really good about their customer care / support, which is one of the reasons why I like Benchmade so much. Thank you! You were correct. Benchmade is sending me a deep carry clip. Bill, Excellent! Glad that tip worked out. Enjoy your new clip! I have a PM2 and think of getting me another “high end” knife. I am really struggling between a Spyderco Sage 1 and the updated mini griptilian 555-1 (or even the regular mini griptilian 555). Do you have any advise? Also, do prefer the sheepsfoot blade over this drop point? Thanks for stopping by. As much as I enjoy the Sage 1, I would go for the Mini Griptilian 555-1. It’s a totally different knife from the PM2 and this re-worked version in G-10 is beautifully done. It’s also smaller than the Sage 1 and would probably be a better compliment in a small collection. My preference is for the drop point version purely because I prefer the look of the drop point version, and the thumb studs work just fine. Ultimately my suggestion is to buy what you like. At the end of the day I don’t think there is a tremendous difference between the sheepsfoot and drop point. Thank you so much for your prompt reply. BTW, I really like your writing style!!! Good job! My pleasure, Li. Thanks for taking the time out to ask a question. And thank you for the kind words I appreciate the kudos! I love my 551 Griptilian full size version,my question is it possible to buy original handle scales from Benchmade? I want to change colors once in awhile but I can’t find any online anywhere.Thankyou for your time.James D Myers. You may be able to if you contact Benchmade directly, but beyond that I am unaware of them selling them on the retail market. That said, there are plenty of aftermarket options. I have a solution for you! Benchmade doesn’t sell them, but there is a company called Applied Weapons Technologies that makes machined aluminum grip kits. They always sell off their leftover standard grips for a reasonable price. I’d recommend checking out their website. Hope that helps you find what you’re looking for. Very cool, Jake! Thank you! Jake Thankyou very much for the info,I went on the site you recommend and ordered two sets of Griptilian scales. I just want to say that I appreciate the fact that you helped me even though you don’t know me,thanks again.If I can ever do the same by all means give a shout at myersp40@gmail.com. Thankyou. I’m just happy to hear you found what you were looking for. No one in my life outside of the Internet really knows or cares what an axis lock is or what EDC stands for, so it’s nice to help someone who does. Take care and I hope you enjoy your new scales. Please comment on your comparison of the Benchmade 551-1 with the Boye folding drop point. Unfortunately I have never handled a Boye folding drop point. You are talking about the custom, right? They look very cool. I wish I could comment further. Can you at least comment on cobalt steel used in knife blades? I have never actually used this metal, so I am only speaking from some relatively quick research as I was previously unfamiliar with David’s cobalt blades. It appears that this is actually not steel, as there is no iron in it. It’s a premium blade material known for it’s rust and corrosion resistance. It is soft, but has high wear resistance and sharpens easily. It looks like interesting stuff. Conventional stainless steel will rust, and will have a higher hardness. It looks like David makes these knives for boating. If that is what you are looking to use the knife for, then I’m sure it’s a fine blade for the task. David has a long and excellent reputation as a knife maker. As usual, great review. I don’t think this knife gets the praise it deserves. I’ve held the 551-1 a few times and it is impressive. The fit and finish on all of them was excellent. It’s a much different knife then the old 551. Incredible steel that is similiar to M390, G-10. I love the open back construction, the grey scales and the blue pillars. I think it’s worth the price of about $180. Like you, I prefer the 551 over the 550. However, I have an offer to trade my ZT 0562 (G10) for a 1st production run (1000) 550-1. I’m not sure how much value (or future value) the 1st production run adds. Any idea ? Probably none (maybe with a 940).. I think I can get used to the 550 blade and I don’t mind the opening hole. I’m glad I stopped by and read your review.